The Asian Development Bank (ADB) supports the People's Republic of China's (PRC) reform agenda by fostering inclusive economic growth, mainstreaming environmentally sustainable development, and promoting regional and South–South cooperation. Since 1986, ADB has approved $34.84 billion in sovereign loans and $4.13 billion for private sector operations (excluding B Loans) for the PRC. The PRC is transitioning to a new growth model emphasizing quality and sustainability, supported by innovation. ADB's Country Partnership Strategy 2016–2020 for the PRC is fully aligned with the government’s 13th Five-Year Plan, ADB’s Midterm Review of Strategy 2020, and ADB’s approach to supporting upper middle-income countries. It addresses the PRC’s development challenges in climate change and the environment, inclusive growth, knowledge cooperation, and institution building. 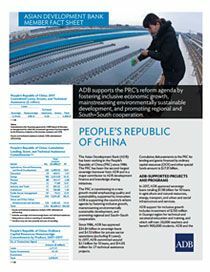 Updated yearly, this ADB Fact Sheet provides social and economic indicators on the PRC as well as concise information on ADB's operations in the country and contact information.